In 2005, Simpson and Raubenheimer postulated the ‘protein leverage hypothesis’ (PLH) to address the question of which nutrient (fat or carbohydrates) is responsible for obesity. The PLH idea is that like numerous other animal species, human macronutrient regulation minimizes variation in absolute protein intake. There is a lot of evidence to this effect (Martínez Steele E. Ultra-processed foods, protein leverage and energy intake in the USA. Public Health Nutr. 2018 Jan;21(1):114-124.). There’s a new study which shows that fat intake, not protein or carbohydrate intake, regulates weight gain in mice (Hu S1, et.al. Dietary Fat, but Not Protein or Carbohydrate, Regulates Energy Intake and Causes Adiposity in Mice. Cell Metab. 2018 Jul 4. pii: S1550-4131(18)30392-9). Mice regulate their food consumption primarily to meet an energy rather than a protein target, but this system can be over-ridden by hedonic factors linked to fat, but not sucrose, consumption. The study has a cute graphic. An ad libitum fed lean mouse didn’t get leaner on higher protein. A lean mouse didn’t get fatter on high carbohydrates. It took higher fat to make a mouse fatter. Interestingly the steps for fat were much larger than the steps for carbohydrates or protein. I can understand why protein would be limited but why did they limit carbohydrates to 30% maximum? Also, what were the other macros when protein was provided? The fat source was “a mix of cocoa butter, coconut oil, menhaden oil, palm oil and sunflower oil” (‘Proof’ it’s fats, not carbs, that cause weight gain – but only in mice. Tuesday July 17 2018.) All of these are refined plant based fats with different types of fats. The base carbohydrate source was corn starch and maltodextrose. The sugar content (sucrose) was varied. The protein source was casein (found in animal milk). 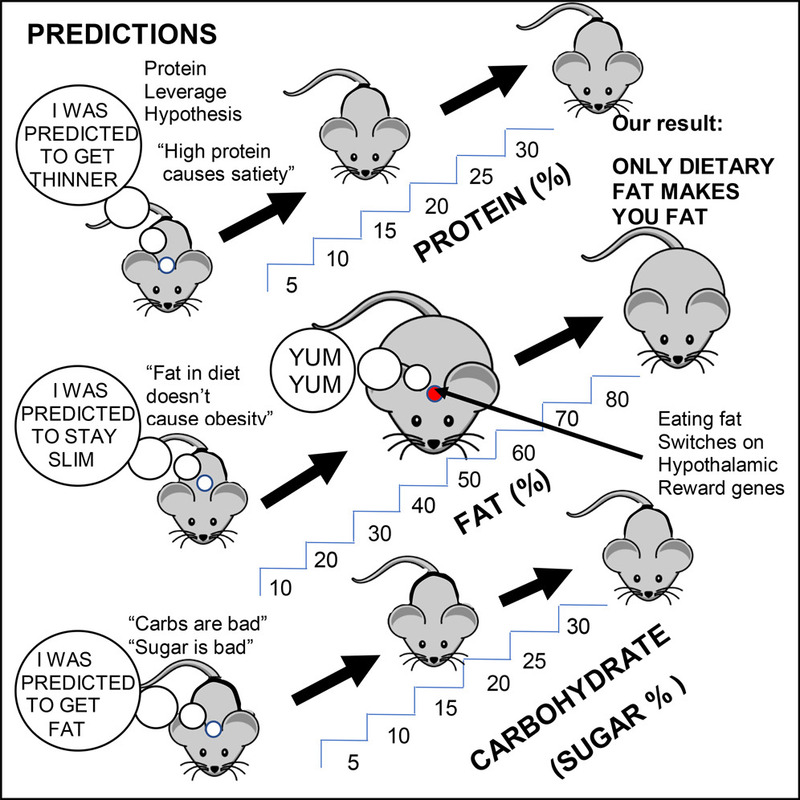 The ‘Proof’ cited above details some of the issues with the mice/men difference (‘Proof’ it’s fats, not carbs, that cause weight gain – but only in mice. Tuesday July 17 2018.). Turned out that there was a peak point in fat when more than 70% of calories from fat resulted in a drop of calories eaten. Lower levels of fat would have had higher levels of carbohydrates.